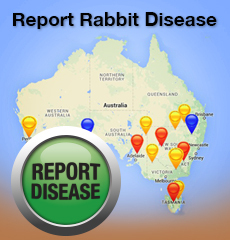 Rabbits are one of Australia’s most widespread and destructive environmental and agricultural vertebrate pests. They cause over $200 million damage to Australia’s agricultural and pastoral industries each year. Farmers, governments and communities need to come together to manage the problems they cause and prevent rabbit populations from increasing further. RabbitScan is a free mapping service that you can use to help with rabbit control in your local area. How can you use RabbitScan? Record and view all your records of rabbits, their damage and control activities all in the one place! Inform your community about rabbit problems. Whether you are a landholder, landcare or community group, local council or school, RabbitScan can help you map rabbits, access resources, connect with other people, and find out about available support. Join RabbitScan to map rabbits in your local area and help build information about rabbits across your region. Rabbit populations are increasing across Australia (largely due to widespread rainfall), and farmers, communities, and researchers are worried they are making a come-back.